Hey there everyone! How is it going. My comp and I had a great week! We had to host the zone meeting, so all of the missionaries from Las Heras, Pico Truncado (don't laugh Ben) and Puerto Deseado had to come up to Caleta. 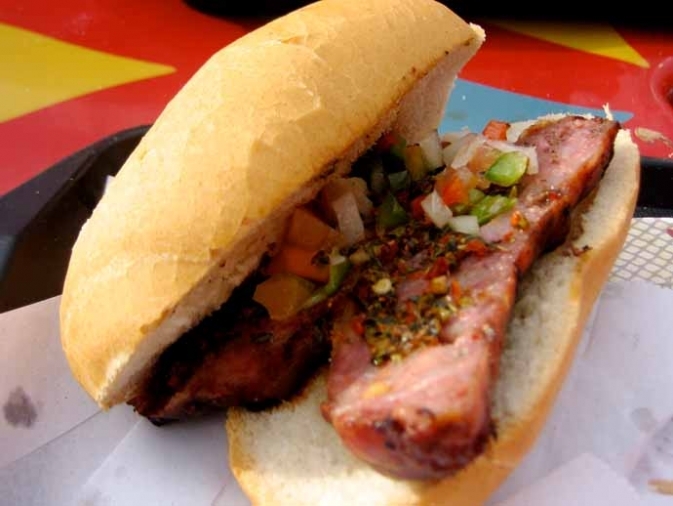 A member made us what is called a choripan, basically giant hot dogs, they were really good. This Saturday I was kind stressed. We were trying to work hard with the investigators but we were just not able to find or teach hardly anyone this week. So Saturday morning I said a prayer and asked God to please remind me why I was on the mission. A few hours later we got a call from a member from Comodoro. He said, "Hey the Elders. I have a reference for you guys. It's my sister in law and she wants to get baptized!" WOW! He told us about why she wanted to change her life, and she asked for the missionaries to come by. So we went by to visit her later that night and she really did have desires to change her life, and was very willing to get baptized, That night I felt the spirit so strongly. It was amazing that she was so prepared and wiling to change. Her name is Diana. We are going to be working with her a lot now. I love you all, I love this gospel, and I love being a missionary! Have a great week!